Chicago CPR parent class sponsored by Bump Club Chicago and the Sprout San Francisco store on Division Street in Chicago. Courtesy of TK Photography. This is the fourth year for Small Business Saturday, and a big weekend for small business owners in Chicago. Chicago CPR, a division of Safety Squad, is a small business that serves the Chicago-land area. Chicago CPR is built on the simple premise of “making confusing education clear, so families can live safely”. The hallmark of our business is our interaction with the community, providing local family safety training services. We thrive on this direct connection with families, and our relationship with other small business owners. 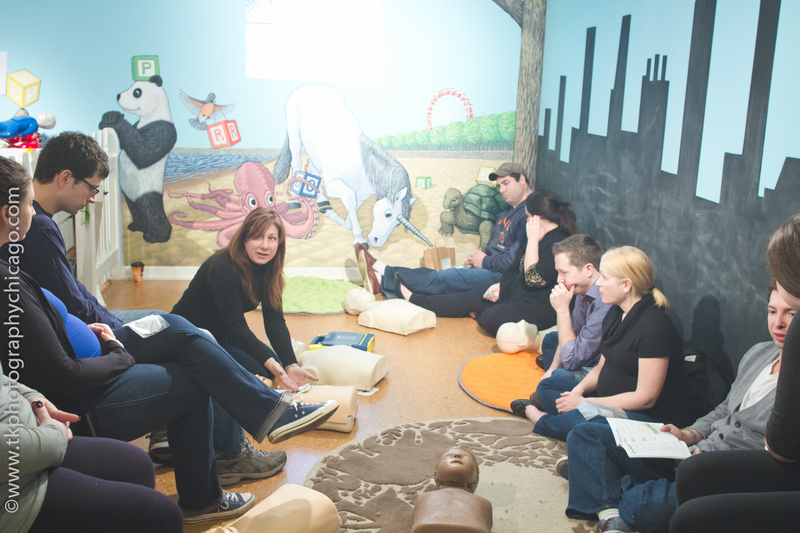 We partner with other small businesses to bring our CPR class to the places where families spend their time – play spaces, coffee shops, baby and kid retailers, etc. Did you know that when people support small businesses, about 45% of the profits go back to the community? Small businesses hire local people, to serve local needs. Just like small businesses are the staple of the local economy, not-for-profit organizations help to create solutions for the tough issues that communities face. In fact, the White House speaks to the power of not-for-profit organizations and other community organizations as essential to growing the middle class. The Office of Management and Budget refers to NFPs and other philanthropic organizations as “a safety net for those most in need.” A safety net. This is something all of us at Safety Squad and Chicago CPR can relate to. How will you support your community? If you are an American Express cardholder, register your card for your $10 reward for shopping at a local small business on Small Business Saturday. And learn about NFPs like HealthConnect One, whose vision – like mine – is to see every baby, mother and family thrive in a healthy community.